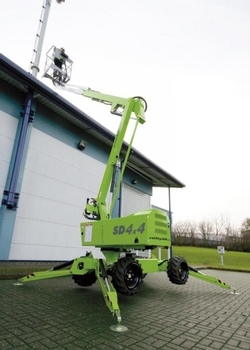 The SD120T self drive work platform delivers an impressive working envelope and with the advantage of a telescopic upper boom, supreme accuracy when positioning the platform. Hydraulic outriggers and 45% gradeability allow the SD120T work self drive platform to be driven and levelled on uneven surfaces making it ideal for environments with rough or softer ground and its low overall weight means better fuel efficiency and lower transportation costs. Niftylift's highly effective Bi-Energy system increases flexibility and maximises utilisation allowing the SD120T self drive work platform to operate for longer and in a wider range of environments.